The new membership, roles and profile features introduced in ASP.NET 2.0 significantly reduce development time that is otherwise spent in traditional approaches. Securing your web site by implementing a flexile membership scheme backed with role based security is required in many professional web sites. In this article series we are going to see these features in action with the help of an example. The web site has three roles - NormalUsers, PowerUsers and Administrators. When a user registers with the web site by default he is assigned to NormalUsers role. Later on the administrator may add him to any other role. Whenever anybody tries to access the web site, the user should be asked for User ID and password. Upon supplying a correct User ID and Password the user should be taken to the main page of the web site. Depending upon the role of the user the content of the main page is rendered. In order to store Membership, Roles and Profile data in a SQL Server database we must configure it using aspnet_regsql.exe command line tool. The tool starts a wizard that guides you through the steps. The tool creates certain tables and stored procedures in the database that are used by these features. Figure 1 and Figure 2 shows the main steps of this tool. The step indicated by Figure 1 allows us to configure the database for membership, roles and profile services. The same step can be used if at all we decide to remove the services for some reason. 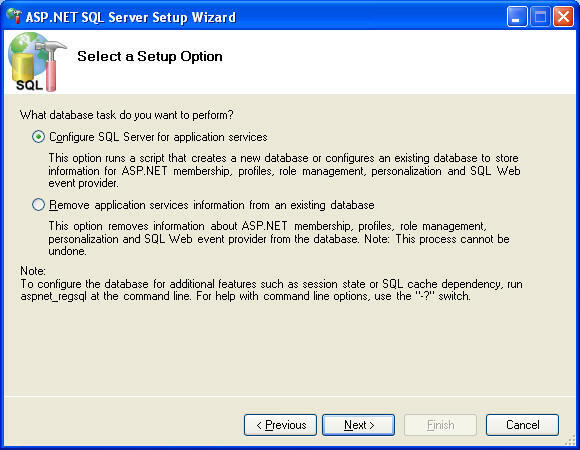 The step indicated by Figure 2 allows us to specify the database that is to be configured. Though not mandetory it would be interesting to know the tables used by these features. The following table lists the tables used by membership, roles and profile features respectively. The markup consists of various sections. 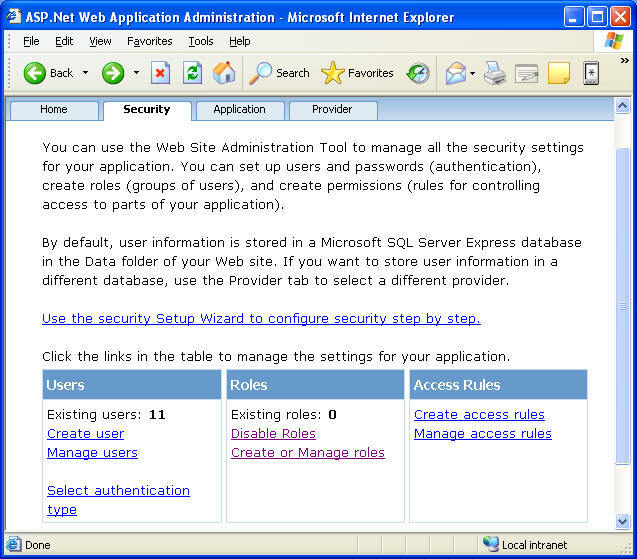 In order to create roles needed by our application, we will use Web Site Administration Tool accessible via WebSite > ASP.NET Configuration menu option. Figure 3 shows the Security tab of this tool. 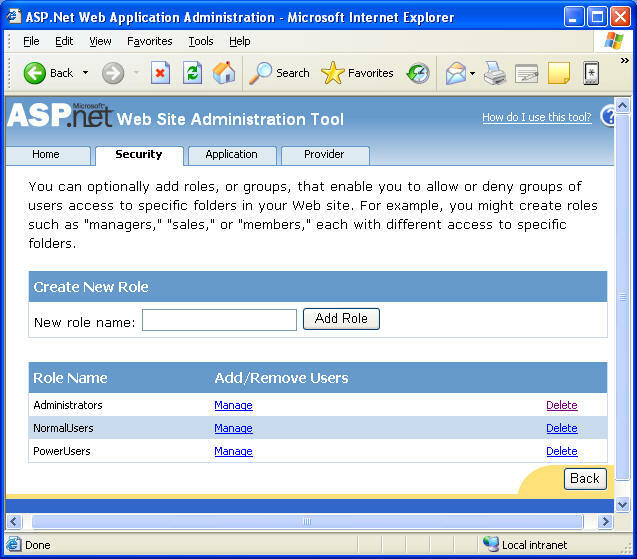 As you can see the Roles section allows you to create or manager roles of the web site. Figure 4 shows the roles created using this tool. Traditionally developers used to create a user registration page by assembling various controls such as TextBoxes, DropDownLists and Buttons. Fortunately ASP.NET 2.0 comes with a control called CreateUserWizard that simplifies the job. This control not only provides readymade registration functionality but also allows you to customize it. In our example the first five pieces about a user i.e. User ID, Password, Email, Security Question and Security Answer are collected by the control out of the box. In order to collect the remaining pieces we need to customize the control by adding our own "Wizard Step". Proceed by adding a new web form called Login.aspx. Drag and drop a CreateUserWizard control on it. 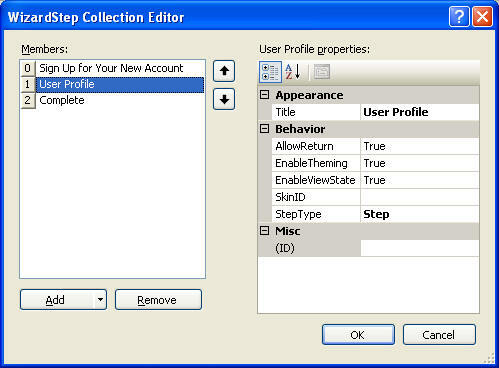 From the smart tags select "Add/Remove wizard steps" to open a dialog as shown in Figure 5. Add a new "Templated Wizard Step" using Add button and set its Title property to "User Profile" and StepType property to Step. Now design the step as shown in Figure 6. 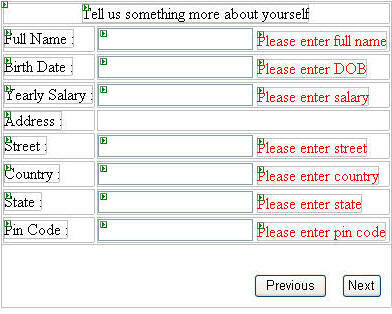 The template consists of TextBoxes and RequiredFieldValidator controls for accepting extended user information (profile). After you finish designing the template add the following code in NextButtonClick event handler of the CreateUserWizard control. This event is raised when the user click on any Next button. Here, we check the index of the current step via CurrentStepIndex property of WizardNavigationEventArgs class. Inside the if condition we get reference to each TextBox with the help of FindControl() method. The value entered in the textBox is then assigned to the corresponding profile property. Note that the profile properties that you specified in the web.config file appear as properties of the Profile object. We want that initially all the users be part of NormalUsers role. This is done by handling CreatedUser event of the CreateUserWizard control. Here, we used AddUserToRole() method of the Roles object to add the current user to NormalUsers role. The user name is retrieved via UserName property of CreateUserWizard control. Finally, set the ContinueDestinationPageUrl property of CreateUserWizard control to Default.aspx. That's it! 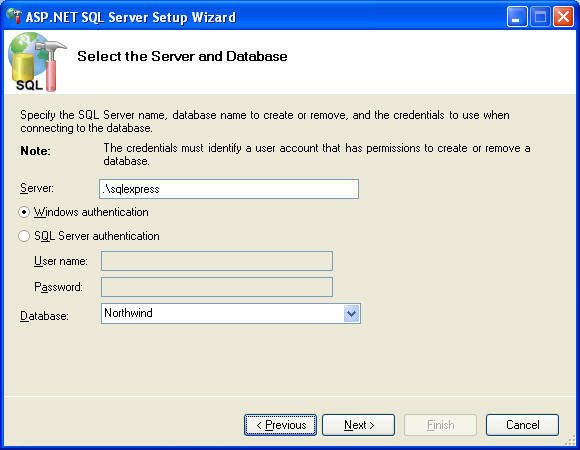 You can now run the Login.aspx and create new users in the system using the CreateUserWizard control. How administrator can assign users to one or more roles. How users can login to the web site. How to develop Default.aspx that shows content for different roles.